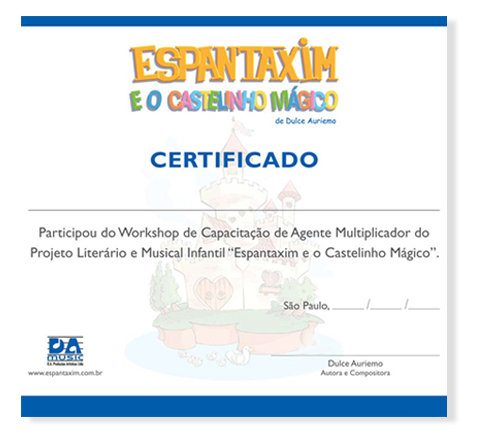 Educators are offered a workshop entitled "Train the Trainers for the Children’s Literary and Musical Project Espantaxim and the Magic Little Castle" so that they can learn how the project may be used as a curricular support in the classroom, and then be able to explore its content to the fullest and adequately convey it to the children. Schedule a workshop for the teaching staff of your school to train the trainers for the Children’s Literary and Musical Project “Espantaxim and the Magic Little Castle”. Contact us by calling: 55 (11) 3045-9282.